How to Record Sound from YouTube Videos? 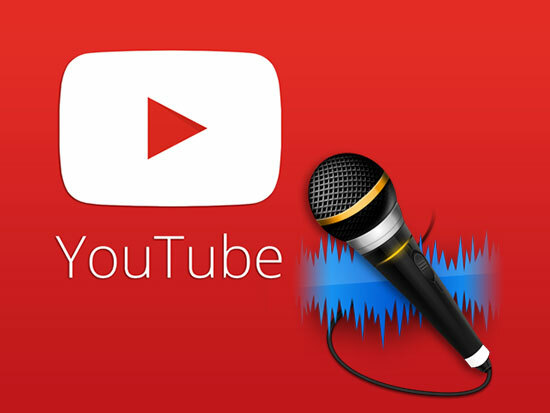 Have you ever wanted to record sound from YouTube videos? YouTube is a great video source which hosts a wide variety of music videos for new music and hard-to-find classics. With today’s benefits of fast broadband access, each of us can make use of the streaming media. However, there are still times when you want to get the audio from YouTube videos. For example, you may want to play music on a certain device which lacks internet connectivity, or you are on the way for travelling where it is impractical to stream your audio. This can be more convenient to get free music in our pocket for playing them on the iPhone, iPad, or to store them locally for CD burning and music collection. As there is not any workable button like “record audio” on YouTube, so how to do? No worry, we can use a reliable third-party tool to record audio from YouTube videos directly. There is a wide choice of tools available to accomplish this, why not choose the easiest one to record sound from YouTube videos? This post will introduce a recommendable sound recorder program, Free Sound Recorder , and some related tips to make your recording without hassle. How to Use Free Sound Recorder to Record Sound from YouTube Videos? Free Sound Recorder is a comprehensive sound recording utility, able to record any internal and external sound without losing quality. No need for installing other audio editing software, Free Sound Recorder allows you to enhance the recordings directly. It is highly effective overall that you can output your recording with just 3 steps. Not just YouTube, it has the ability to record from over 500 streaming sites, which makes it a pleasure to use. Also, it can identify YouTube music information like artist, title, album and genre. Once you download Free Sound Recorder, double click the program icon to install it. It will take a very short time to finish. Click the “Record” button to activate the online music recorder. Click “Show mixer window” to choose sound source from the “Recording Mixer”. Then, select proper recording device “Stereo Mix” from “Recording Device” dropdown menu. Adjust the volume and balance. Go to “Options” – “General Settings”, choose an output format. Click “Settings” and you can use the presets or specify the parameters to adjust the recording quality. Click “Change” to select an output folder. Play the YouTube video you want to record. To ensure a smooth playing without any disruption, you’d better get the video fully loaded before recording. Click “Start recording” to start. Click “Stop recording” to stop. The recorded video sound will be output to the output folder & listed in the file list with detailed information. You can play the recording with the built-in player. That’s how to record sound from YouTube videos. Tips: With “Stereo Mix” enabled, you can open up your favorite recording program and select that instead of your microphone before you record. This works well when you want to capture audio from live web-casts–that don’t necessarily allow you to download content immediately. Record any sound you hear and export then in any format like MP3, WMA (https://en.wikipedia.org/wiki/Windows_Media_Audio), WAV or OGG with top quality! You can record sound from a microphone, an external LP, cassette, CD/DVD player, AM/FM/Satellite radio, etc. It also allows you to record Internet broadcasts, streaming audio or local audio files reproduced by other programs. Sometimes the recorded sound might be not perfect. Free Sound Recorder has a built-in audio editor which helps edit your recordings without extra downloading and installing other programs. It provides some basic editing tools like Cut, Copy, Paste, Crop, Delete, etc. and audio effects like Echo, Fade in/out , Amplify, Chorus, etc., satisfying all your needs. Tired of waiting for a longtime recording? Free Sound Recorder can solve the problem by specifying a schedule for the recording. It records sound from a website or anything that runs on your desktop automatically at a specified time. 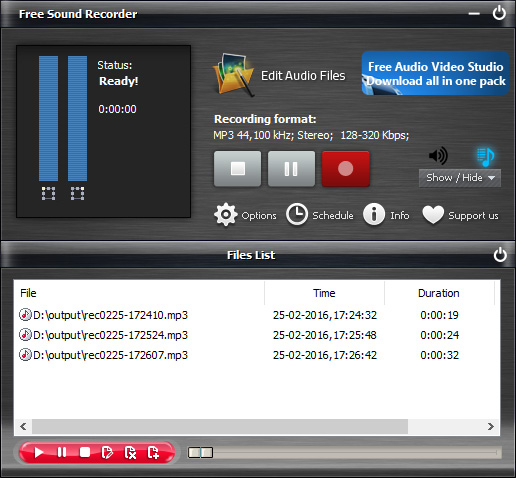 Free Sound Recorder supports multiple output audio formats. It can detect the recording formats that your sound card supports and automatically sets the application’s parameters of each format for the best performance. Different from many other methods and audio recorders, Free Sound Recorder provides the best combination of features without costing a penny. The straightforward workflow makes each user’s recording easier than ever including beginners and users without any skills.